like this place, please book me a room. There is no reason to stay anywhere else. Jamestown 2007 Celebration - America Turns 400! Another reason to visit Colonial Williamsburg is the Jamestown 2007 Celebration. The 400th Anniversary of America will attract visitors from all over the world - anxious to experience the special events and festivities that will continue through the fall of 2007. The celebration is already in progress, and began with the launching of the Godspeed, an authentic replica of the ship that actually transported settlers from Europe. The Godspeed will dock at six major cities along the eastern coast. January -- Religious Freedom Heritage Month – Learn more about the religious heritage of 17th- and 18th-century colonial Virginia. February -- Black History Month – Explore the lives of early Africans in Virginia and their western central African background. March -- Women’s History Month – Discuss the roles of women in the 17th and 18th centuries with costumed interpreters as they perform daily tasks. March 17-18 -- Military Through the Ages – Re-enactors depicting soldiers demonstrate military tactics, weaponry and camp life. April -- Natural Environment Month – Discover how Virginia native plants and the plants and herbs the English brought with them were used by the people of Virginia. Spring -- Opening of "The World of 1607" - A one-year exhibition portrays Jamestown and Virginia as part of an intellectual, social and economic “new world” that brought together peoples and ideas from around the globe. May -- Jamestown Month – Enjoy festivities commemorating the 400th anniversary of the nation’s beginnings at Jamestown. May 11-13 -- America’s Anniversary Weekend - Maritime demonstrations and ceremonies at Jamestown Settlement are among major events taking place throughout Virginia’s Historic Triangle to commemorate the 400th anniversary of America’s first permanent settlement. June -- Cultures of Virginia Month – Examine the cultures of the Powhatan Indians, Africans and English and how they interacted in early Virginia. July -- Celebration of Liberty Month – Discover how the legislative assembly created at Jamestown in 1619 gave rise to the Virginia House of Burgesses, Continental Congress and the Declaration of Independence. August -- Free Enterprise/Agriculture and Industry Month – Explore how the early efforts of Jamestown settlers to make a profit for the investors of the Virginia Company evolved into the tobacco economy of 18th-century Virginia. September -- Rule of Law Month – Learn how martial law deemed necessary during periods of warfare would give way to representative government. October -- Virginia History and Archaeology Month – Discover what has been learned about Virginia’s history from archaeological excavations and primary historical sources. November -- Virginia Indian Heritage Month – In observance of American Indian Month, there will be a special focus on the culture of Virginia Indians and their history. November 22-24 -- Foods & Feasts of Colonial Virginia - Explore Virginia cuisine of the 17th and 18th centuries during this three-day event beginning on Thanksgiving Day. Learn how food was gathered, preserved and prepared on land and at sea by Virginia's English colonists and Powhatan Indians. 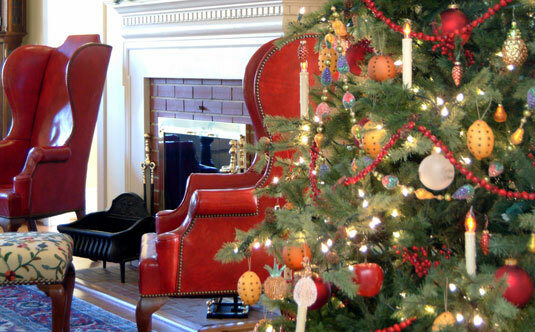 December 22-31 -- A Colonial Christmas - Experience 17th- and 18th-century holiday traditions. A film and special guided tours compare and contrast English Christmas customs of the period with how the season may have been observed in the difficult early years of the Jamestown colony.